File Types: JPG,EPS,All Files; File Size: 1.17 MB; Requirements: Adobe CS1+; Vector: Yes. Kids with backpacks going on outdoor hiking trip. 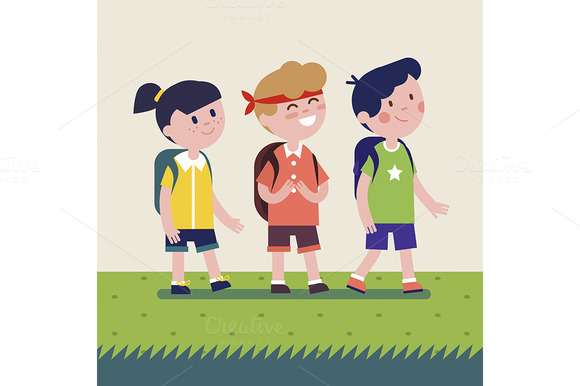 Girl and two boys walking together on summer adventure or expedition. Modern flat vector illustration clipart. Keywords: flat, icon, vector, isolated, illustration, symbol, sign, concept, object, template, white, background, design, cartoon, metaphor, clipart, character, person, people, kid, child, small, children, childhood, infant, play, fun, joyful, joy, cute, youth, young, smiling, caucasian, cheerful, human, girl, female, woman, daughter, lady, schoolgirl, boy, male, man, son, preschooler, schoolboy, school, preschool, schoolchild, student, pupil, elementary, grade, first grader, activity, playing, game, entertainment, amusement, playful, enjoyment, happiness, recreation, pleasure, pastime, outdoors, open air, nature, public, park, garden, fresh, grass, vacation, adventure, holiday, spring, summer, hike, hiking, expedition, trip, excursion, backpacking, group, friends, friendship, backpack, walking, together, togetherness, happy, journey, trek, face.